Fractures are among the most common pathologies that a maxillofacial clinician confronts in his practice and possible common investigations performed for the same would range from plain film radiography to advanced imaging techniques such as computed tomography and more recently cone-beam volumetric imaging or cone-beam computed tomography (CBCT). In practice, trauma and direct injury are the histories which will often give a clue to the clinician about a suspect fracture and prompt investigations. However, self-inflicted trauma or occult trauma may not be revealed in the patient's history and may pose a diagnostic and therapeutic challenge to the clinician. Fractures of the articular eminence are a rare entity and only three cases have been documented to the best of our knowledge. These have been associated with a history of direct trauma. Here, is an unusual case of articular eminence fracture due to self-corrected disc interference. The incidence of fractures of the articular eminence may be higher than reported; such fractures are masked by other major injuries or simply not visualized on plain film. Indeed, in the present case, there was evidence of fracture in the panoramic radiograph, however, it was not localizable as the eminence fracture; the fracture was identified by CBCT as a fragment from the eminence. A 69-year-old female patient reported with 3-month history of right-sided sharp continuous facial pain radiating to the right ear and temporal region. The patient gave a history of difficulty in opening the mouth a few weeks ago which she opened forcibly, and noticed a loud popping sound followed by the present pain. Her medical history revealed that the patient was osteoarthritic, hypertensive with dyslipidemia, had bilateral renal calculi, and left-sided hydronephrosis, and on irregular medication. General examination revealed a rheumatoid nodule on the right little finger, bilateral deviation of second toe, and severe tenderness of the right TMJ and muscles of mastication. Intraoral examination was not significantly contributory. Orthopantomograph showed an irregular radiopacity of size 1 × 1 cm seen in the inferior soft tissue space of right articular eminence [Figure 1]. CBCT was advised to view this fragment three dimensionally and to know its anatomical location and orientation. 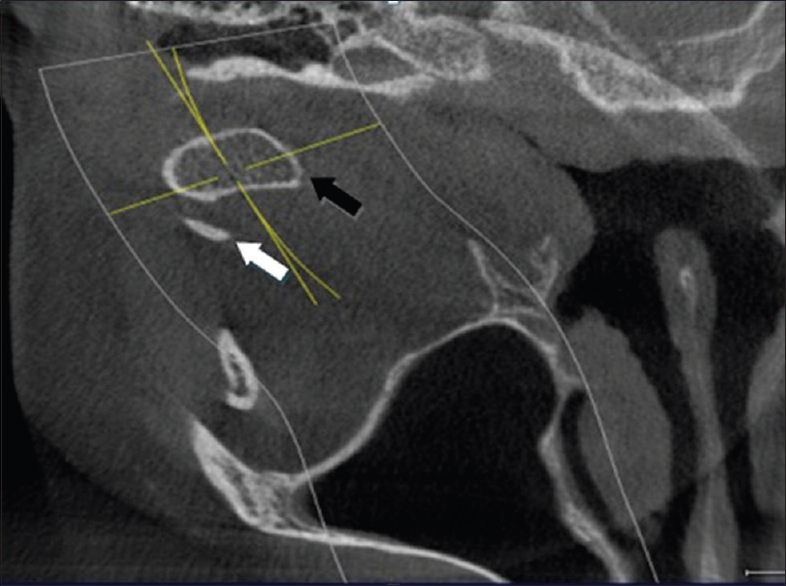 With the CBCT the head of condyle was viewed from all sides, and the probability of fracture of the condylar head was eliminated. The irregular discontinuity along the surface of the articular eminence, and the morphology of the fractured fragment lead to the confirmation of the diagnosis of articular eminence fracture [Figure 2] and [Figure 3]. The patient was informed about the situation. Considering the age, surgical removal of the fragment was not carried out. She was treated conservatively by advising soft diet and to consciously limit mandibular movements. The patient reported with complete remission of the severe pain and mild persisting arthralgia in 2 weeks. 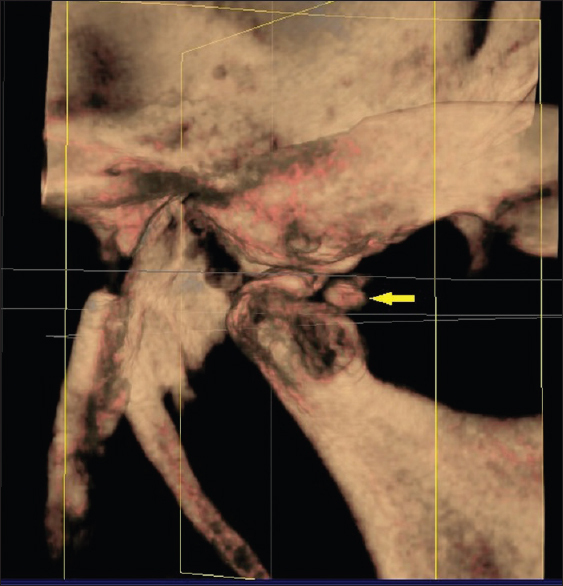 She was asked to report for a review with OPG/CBCT after 6 months, during which she was found to be completely asymptomatic, however, she refused to undergo a roentgenographic examination as she was pain free. She was lost for further review. Articular eminence fractures are an uncommon clinical presentation or possibly an underdiagnosed clinical presentation owing to its relatively asymptomatic presentation and subtle radiographic presentation. Keith et al. presented a case of compound fracture of the articular eminence owing to direct trauma, which was managed by repositioning the fractured fragment and stabilized by intermaxillary fixation. In our case, we chose to not carry out surgical intervention and manage the situation by conservative means considering the age and willingness of the patient. Miyauchi et al. presented a case of articular eminence fracture in a 24-year-old male, which presented as a temporomandibular disorder and which occurred because of a traffic accident. The case was successfully managed by conservative measures. Tay and Peck reported a case of isolated fracture of the articular eminence sustained to a high impact fall and was managed successfully by conservative means. The management of fractures of the articular eminence would consist of surgical intervention with reduction of the fracture if it was interfering with functionality. If such is not the case, a conservative approach consisting of symptomatic management of pain coupled with oral physiotherapy to maintain functionality is recommended. Thus, CBCT is an attractive, efficient, and purposeful imaging modality in the diagnosis of subtle changes of the maxillofacial region with immense value in the diagnosis and management of maxillofacial injuries, as highlighted by our report of an articular eminence fracture detected by CBCT. Keith O, Jones GM, Shepherd JP. Fracture of the articular eminence. Report of a case. Int J Oral Maxillofac Surg 1990;19:79-80. Miyauchi K, Sano K, Nagai M, Ogasawara T, Nakamura M, Kitagawa Y, et al. Occult fractures of articular eminence and glenoid fossa presenting as temporomandibular disorder: A case report. Oral Surg Oral Med Oral Pathol Oral Radiol 2006;101:e101-5. Tay AB, Peck RH. Solitary Fracture of the articular eminence: A case report. J Oral Maxillofac Surg 2001;59:808-10. Ziegler CM, Wörtche R, Brief J, Hassfeld S. Clinical indications for digital volume tomography in oral and maxillofacial surgery. Dentomaxillofac Radiol 2002;31:126-30. Scarfe WC. 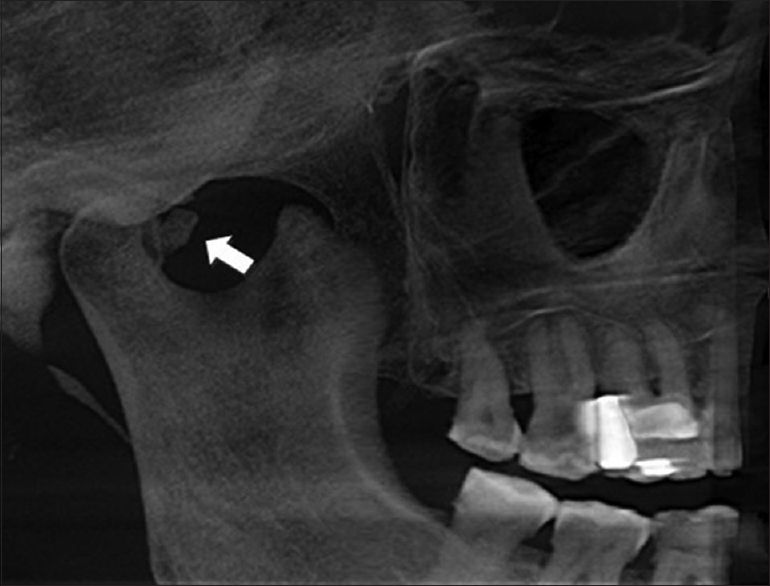 Imaging of maxillofacial trauma: Evolutions and emerging revolutions. Oral Surg Oral Med Oral Pathol Oral Radiol Endod 2005;100:S75-96. Choudhary AB, Motwani MB, Degwekar SS, Bhowate RR, Banode PJ, Yadav AO, et al. Utility of digital volume tomography in maxillofacial trauma. J Oral Maxillofac Surg 2011;69:e135-40. Ilgüy D, Ilgüy M, Fisekcioglu E, Bayirli G. Detection of jaw and root fractures using cone beam computed tomography: A case report. Dentomaxillofac Radiol 2009;38:169-73. Klenk G, Kovacs A. Do we need three-dimensional computed tomography in maxillofacial surgery? J Craniofac Surg 2004;15:842-50. Markowitz BL, Sinow JD, Kawamoto HK Jr, Shewmake K, Khoumehr F. Prospective comparison of axial computed tomography and standard and panoramic radiographs in the diagnosis of mandibular fractures. Ann Plast Surg 1999;42:163-9. Kaeppler G, Cornelius CP, Ehrenfeld M, Mast G. Diagnostic efficacy of cone-beam computed tomography for mandibular fractures. Oral Surg Oral Med Oral Pathol Oral Radiol 2013;116:98-104. Schulze D, Heiland M, Thurmann H, Adam G. Radiation exposure during midfacial imaging using 4- and 16-slice computed tomography, cone beam computed tomography systems and conventional radiography. Dentomaxillofac Radiol 2004;33:83-6.